Purpose: Use this document as a reference for modifying a birthdate in ctcLink. Enter the employee’s emplid In the Empl ID field. 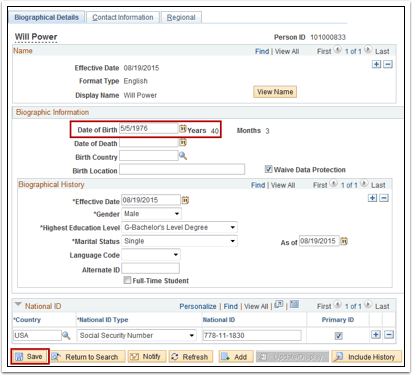 Enter the new birthdate in the Date of Birth field. IMPORTANT!– If an error message displays after clicking the Save button, the effective dates on the page are set to 1901. They must be updated in order to proceed. Proceed to the following steps. Click the Correct History button. If you do not have this button, contact your HR Administrator for additional assistance. 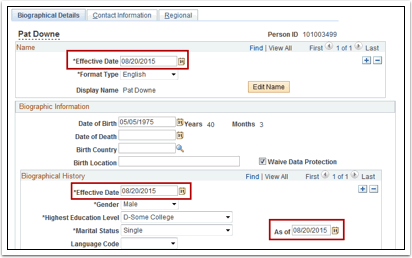 Change the Effective Date fields to the current date on the Biographical Details page. Click the Edit/View Address Detail link. 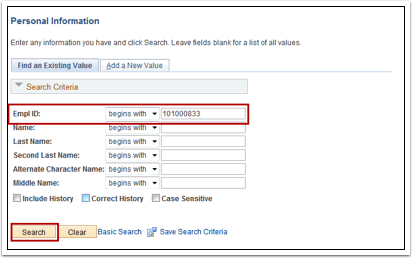 Change the Effective date field to the current date. Change the Effect Date field to the current date. Click the Biographical Information tab. 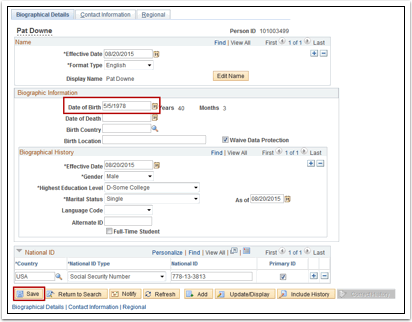 Change the birthdate in the Date of Birth field to the correct date.